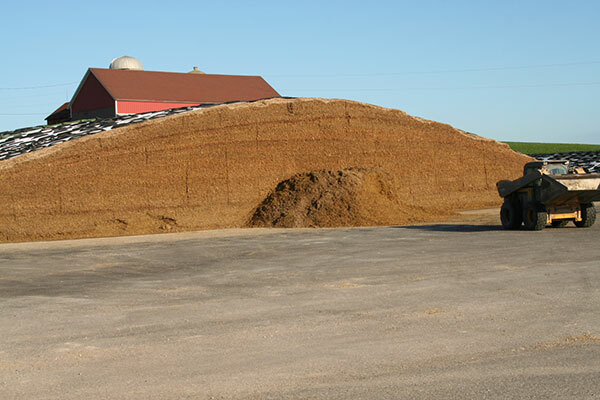 With most hay and corn silage now tucked away for the winter, it’s probably a good time to remind all of those who work around bunker and pile silos that feedout faces are always subject to collapse. · Keep people and machinery away from the feedout face. This includes both at the ground level and on top of the silage pile. A rule of thumb is to not stand closer to the face than three times its height. · Never work alone when in close proximity to the feedout face. · Be particularly cautious when removing tires, bags and/or plastic covers that are near the feedout face. · When removing feed, don’t undercut the face. Shave or remove feed from the top down. Face height should never be higher than the reach of the removal equipment. · Never sample forage directly from the face; instead, sample from the loader bucket once it is a safe distance from the silage face. · Remember, even well-packed, well-managed bunkers and piles are subject to avalanche. Last year, Bolsen and his wife produced a DVD entitled Silage Safety. The 17-minute video was dedicated to Jason Leadingham, a silage haul-back driver who was killed in January 2014 in a silage avalanche. Its content includes testimony of those who participated in recovery efforts and is filled with practical information on how to help prevent silage avalanche fatalities. It makes for a great employee training video. To obtain a free copy, contact Ruthie Bolsen (ruthbolsen@hotmail.com or 512-301-2281).